Premium, professional quality canvas gallery wrap. Need other sizes besides 16x20? Every size is 50% off for a limited time, no coupon code needed! Go to the link below and choose a horizontal or vertical orientation. Personalize your canvas by uploading your photos. At checkout, enter your redemption code in the "promo code" box. Turnaround time is 5-10 business days. Shipping is via ground and is a flat rate of $3.99 per canvas. Ordering as a gift? Please order by 12/09/14 to receive your canvas by 12/24/14. Redeem by 2/28/14. Purchased value of $29 may be applied towards any online purchase after 2/28/14. 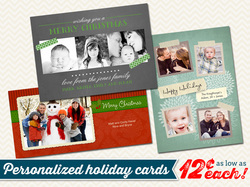 Create a unique holiday card for as low as $0.12 each! Hundreds of designs and 2 sizes to choose from. 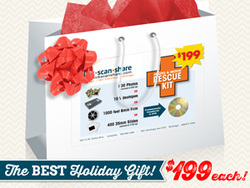 We transfer your old photos, video tapes, film reels, and slides to DVD, so you can share your family memories!